Well, I’ve gone and signed myself up for another baking event! Oy vey! If you read my post on the Food Blogger’s Cookie Swap you know that baking is not my forte and my organizational skills need to be worked on a bit buuuuuut I love helping out a good cause so I decided to join the team! The bake sale is an organized, national event where teams are formed to raise money for the non-profit organization No Kid Hungry. This organization campaigns to end child hunger in the United States and provides food and meals to children. This is important, folks!! We are talking about food here–something that we all take for granted and most of us probably don’t think twice about not having! This is the fourth year that the bake sale is happening in Miami but this will be the first for me. 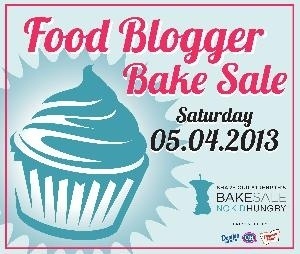 I have joined other Miami food bloggers and we are baking up a storm for charity!! You know that our treats will be good! As a teacher and food blogger I feel compelled to do all that I can to help this organization and I would really appreciate your help! More than 16 million in America live in households that struggle to put food on the table. That’s 1 in 5 kids!! Only 1 in 7 kids who receive free or reduced lunch during the school year receive summer meals. Nearly half of all the people who use the Supplemental Nutritional Assistance Program (SNAP or food stamps) are kids. The easiest way is to make a donation. You can do that by clicking here. If you’re in the South Florida area then mosey on over to our bake sale which will take place on May 4, 2013 at Tropical Park as part of the Southwest Community Farmer’s Market. • $100 gift certificate to Chef Adrianne’s Vineyard Restaurant & Wine Bar. • Wokstar Eleanor Hoh is donating a Gift certificate for two people to attend one of Wokstar Eleanor Hoh’s cooking classes. • $50 gift certificate to 660 Restaurant at the Angler’s Resort. • $50 gift certificate to Lee & Marie’s Cakery. • $50 gift certificate to Haven Gastro-Lounge. Any donation amount helps!! Seriously! $1 can help provide a hungry child with 10 healthy meals. $46 can help connect a child to meals all year-long. Please consider making a donation–no amount is too small!! Thanks! Thanks for mention, Melissa! I didn’t realize you were participating! What a great cause. Hope it went well.